Shorts – which styles suit you best? Ok, hands up if you think that you’re too old for shorts? Or that there aren’t any that really suit you? I hear this a lot and yet for a lot of people their legs are one of their best assets! So, forget worrying about cellulite – we all have it no matter what our age – and get your legs out! 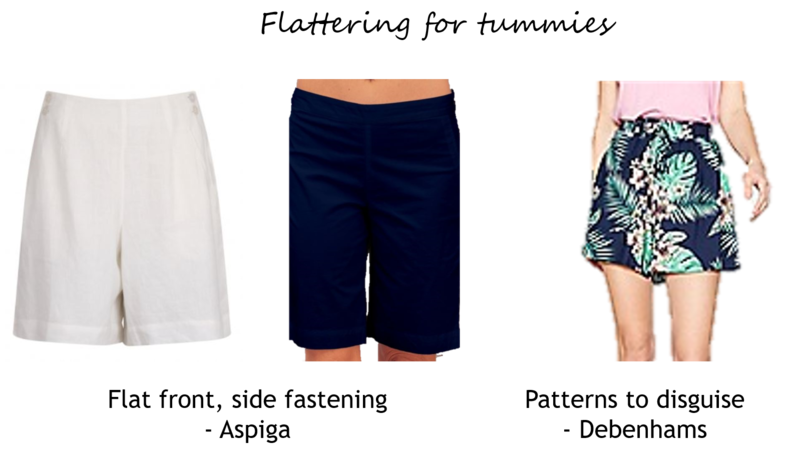 Length – as with most areas of the body, it’s best to avoid your widest point, so the most flattering length for shorts is often mid-length (ie not ‘just-under-your-bottom’ short, but also not knee-length). These washed cotton chino shorts from Pure are a great length, come in 5 colours and contain elastane to make them even more comfy. They’ve also been reduced from £65.00 to £48.75! If you have shorter legs (you might be petite or simply proportionally shorter in your leg), then either choose a shorter style of shorts or go for high waisted shorts, both of which will elongate your legs. I’m petite and have just bought these red ones from Tesco (amazing what finds its way into my trolley whilst doing the food shopping!) – they have a soft feel to them and were an absolute bargain at just £12.50! If you prefer knee length shorts then you might like the white denim shorts from Gap – they are a high waisted style with added stretch for comfort – they also come in a slightly shorter length if you prefer. In fact Gap has an array of lengths and styles of shorts so it’s worth having a look at their selection. If you have a straighter body shape you will look great in crisper fabrics (like cotton, denim etc.) and the simple straighter styles. You can add details like pockets and straighter patterns like stripes. These ticking stripe shorts from Boden, with big patch pockets are great, as are denim bermuda shorts like these from White Stuff. If you have a curvy figure, then think fabric, fabric, fabric! 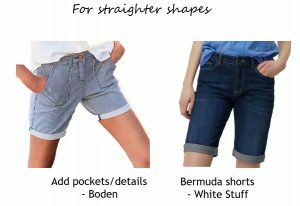 Shorts, a bit like jeans, are often cut in a very straight shape which doesn’t allow for curves. So choose shorts in a fluid material that skims your curves. The navy embroidered shorts from Hush could fit the bill. Or again from Hush, the Lyocell shorts will be super comfy and come in a number of colours! Anything that shows off your waist and flares out slightly at the bottom will balance your hips/thighs, so you could give the higher tie waist wider leg style a try too if you have a small waist and tummy. If you prefer a more fitted style simply avoid materials that are too thin, as some of the the lighter weight fabrics can be less than flattering (they tend to highlight any lumps and bumps!). Instead choose a heavier weight material that contains elastane/lycra (stretch) – like the chino Pure shorts I mentioned above. 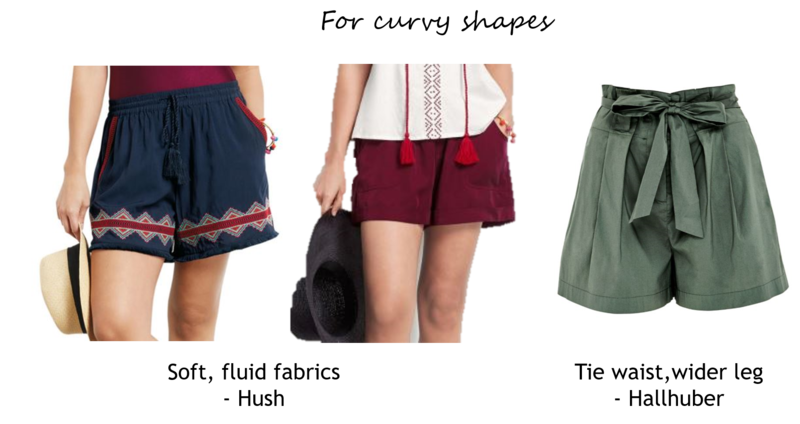 Shorts that have a flat front and side fastening are so flattering over a tummy – these shorts from Aspiga have a side zip/buttons meaning there is no extra bulk over the tummy area. (If only more manufacturers would follow suit! ).The navy bermuda style come in white too. The white ones are fully lined linen. Both are winners in my opinion! You can also use pattern to disguise the tummy, so these tropical print shorts from Debenhams could be fun! Just remember to take into account your scale – a big print will overwhelm a finer/smaller frame. Proportions – if you are shorter in your torso a lower waisted style will help to elongate your body and balance your proportions. Be aware of your body shape though, as low waisted styles can lead to the dreaded ‘muffin top’ if you have a fuller tummy. Dressing them up – there is no need to purely wear your shorts on the beach. I love this outfit by @scotstyleeditor – a great way to dress up your shorts for an evening out simply by adding a more dressy top and necklace. So, no more excuses … time to get those legs out and soak up a bit of vitamin D in the process! 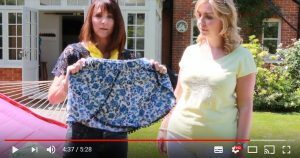 If you’re at a loss to understand your shape, proportions, scale or the styles of shorts that will suit you, take the guesswork out of the equation and book a style consultation. There will be plenty of ‘arrr, that’s why I like x or y tops and don’t like z types of trousers’ moments and you’ll save yourself so much time and money in the future too!